These tiny 12VDC dock lights install totally flush with the surface are waterproof and are “designed to be walked upon”. These waterproof, versatile LED lights are perfect for your dock, boat landing, fishing or swim platform or other projects near water. Our convenient Dock Dot™ kit includes a waterproof LED transformer, photocell timer and even has a WIFI controller option. The DEKOR® Dock Dot™ has a 1” diameter and is a waterproof, LED, dot style light, that is the perfect light for your dock. As part of our Plug-N-Play system, our Dock Dot™ is easy to install. All connections are waterproof and the kit comes with dielectric grease to make sure your connections stay that way. 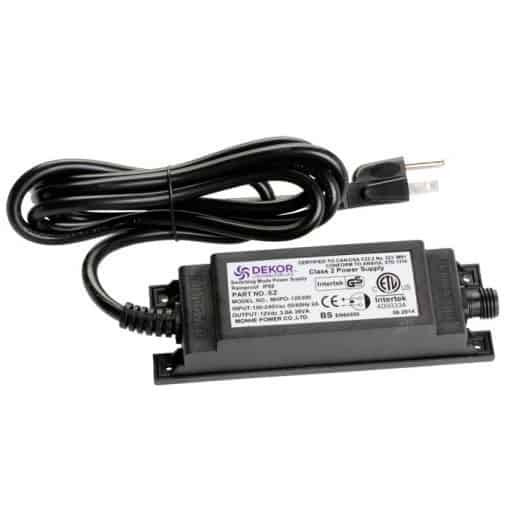 DEKOR uses a 12VDC power system, making it safe to use around water. The Dock Dot™ is completely enclosed in a high impact polycarbonate case that is completely sealed making it water tight. You can use this little light to outline your dock, accent a slip, and with our optional red and green port and starboard lights, you can totally make your dock safe and easy to navigate. 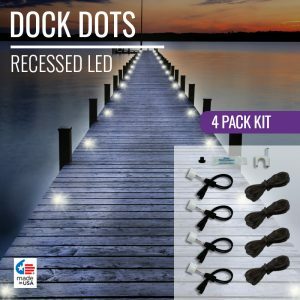 Available in both Standard (38 lumens) or NexGen (78 lumens) LED configurations our Dock Dots™ will make your waterside dock stand out. 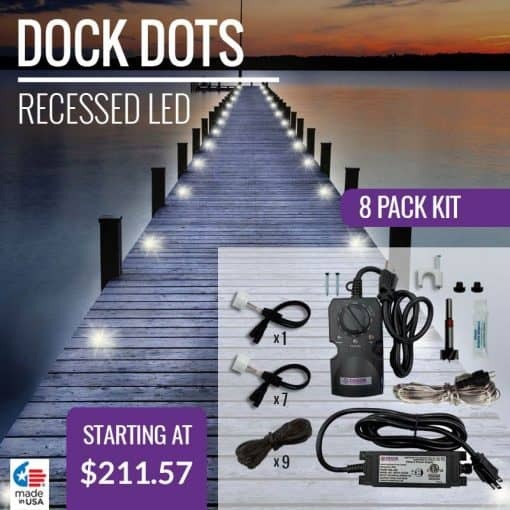 You can connect Dock Dots™ with any of our other world-class products, like our post lamps and post caps to truly create a complete low voltage, LED lighting design that will take your dock to another level. Dimmable warm white light. Dock Dot™ LEDs emit light at 3200° K and are dimmable with DEKOR’s EZDIMMERWP or their WiFi Dimmer and app. Safe and Certified. Dock Dot™ LEDs are safety rated and meet ETL, CE and RCM/CTick safety standards. Long lasting and durable. Dock Dot™ LEDs are extremely strong, will not rust, and are built tough. 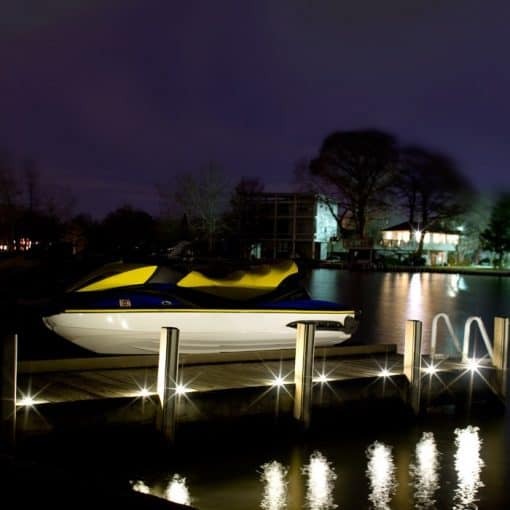 Dock Dot™ LEDs have thick transparent domed poly-carbonate covers that will not yellow with age. 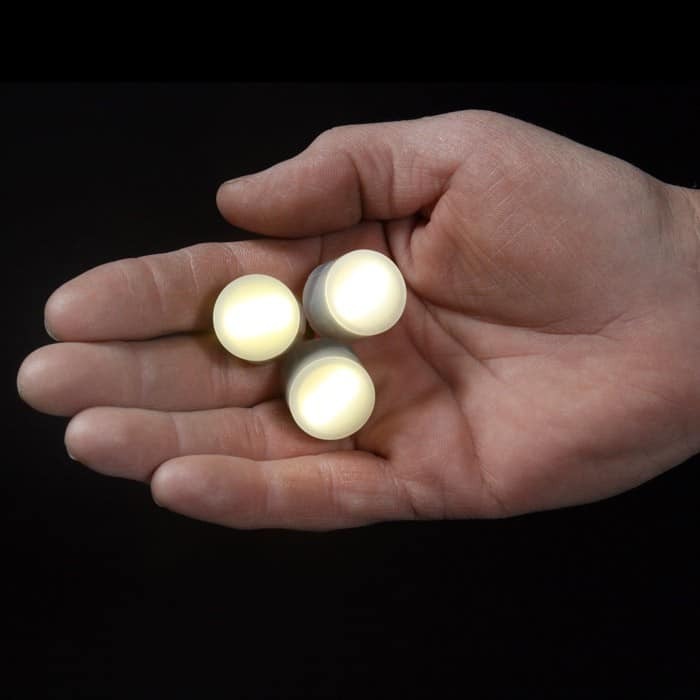 The lights are built to withstand years of “wear and tear” and come with an industry leading 10-year warranty. CREE® LEDs Dock Dots™ are built with high-quality CREE LEDs, known for their super bright light, long life and superior energy efficiency. DEKOR® is a CREE® LEDs Branding Partner. 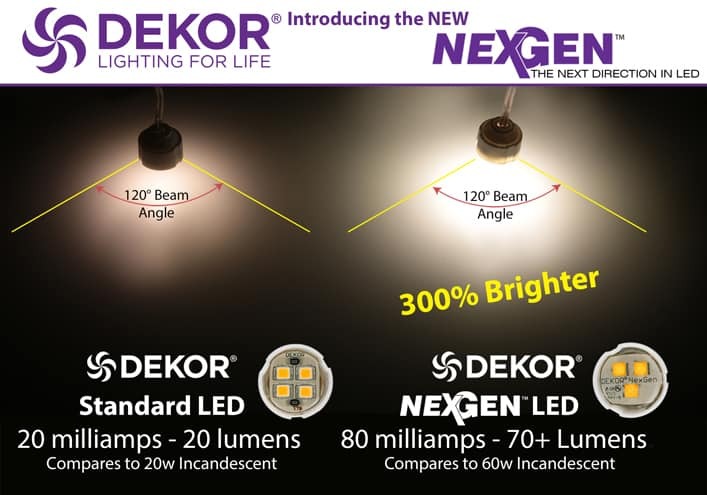 NexGen™ Lighting Option. Dock Dot™ LEDs may be purchased with DEKOR’s standard LED configuration or with new 3X brighter NexGen™ LEDs. NexGen™ LEDs feature CREE® Advanced XT series LEDs and some smart electronics that allow a far greater light output with minimal power consumption. Expandable. The Dock Dot™LED kit comes with 8 light elements … you can add additional lights up to the number supported by the transformer or power supply. If you need more lights, you can just upgrade the transformer. We even offer a port and starboard indicator light kit. Connector Cable Length. 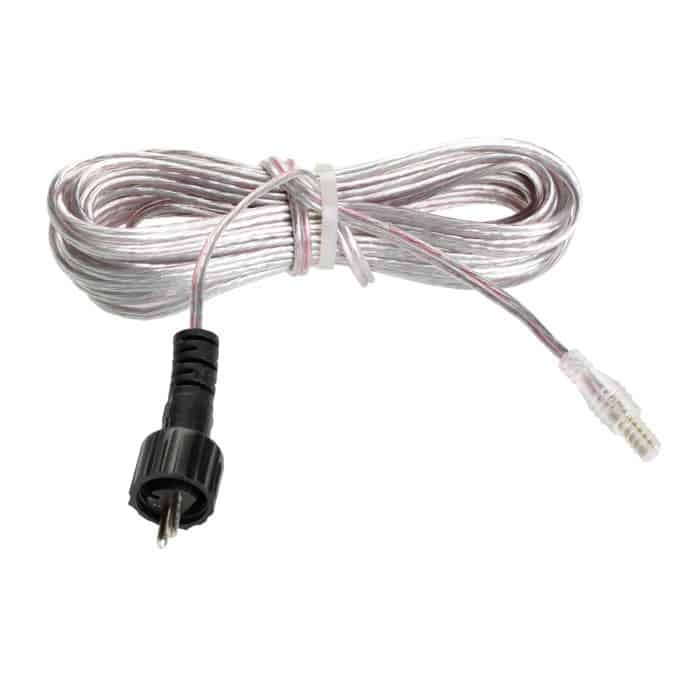 This kit comes with 10 foot or 20-foot heavy duty Plug-N-Play cables so lights can be spaced along the edge of your dock as desired. See what some of our customers have done to turn their docks into showstoppers. The power supply/transformer included with this kit supports up to THIRTY (30) standard LED Dock Dot™ lights or TWENTY FOUR (24) NexGen Dock Dot™ lights. If you are ordering additional Dock Dots™ with your kit, you can select an upgraded transformer when you purchase online. Download Plug-N-Play Dock Lighting Installation Instructions as a PDF. The above instructions are for standard dock installation.